I’ve had blooms on a number of camellias over the past couple of weeks, mostly on small, under cover, pot grown plants. First out was Camellia sasanqua ‘Gay Sue’. This New Zealand raised variety is described in the Camellia Register as having 12 petals and cream anthers. All the blooms I have seen here are anemone formed, some or all of the stamens having become petaloid. To my mind this adds to the charms of this excellent variety. Next up was Camellia sasanqua ‘Cotton Candy’. This has single pink blooms and I have found it to be free flowering and strongly fragrant. I’m not sure I like the smell of sasanqua flowers, its somewhat oily, a smell rather than a fragrance. Scent is very subjective though. The Paradise series of sasanquas were raised by Bob Cherry in Australia where they were marketed as hedging plants. I currently have two flowering, ‘Paradise Little Liane’ and ‘Paradise Blush’. ‘Little Liane’ is one of only three in the series to have Breeders Rights, so Bob presumably thought it had particular merit. I like it very much; it is a plant of diminutive stature with very small leaves and small white double flowers which I have found to have a proper perfume, not strong, but pleasant. It is not very vigorous and has grown better for me under cover. ‘Paradise Blush’ seems more robust, though I have not yet tried it outdoors. ‘Bonanza’ has double flowers of a particularly intense reddish pink. I have yet to detect any fragrance. It is described in the Register as a chance seedling, which encourages me to keep on collecting and sowing camellia seeds; I may yet make my fortune. The plant I have bearing the name ‘Crimson King’ does not match the description in the Register. Mine has smallish single flowers with quite narrow petals. It is deep pink going on red, but is not at all free flowering. The description “Thick, broad petalled flowers of great substance, well shaped, deep crimson” is surely of something different. Camellia ‘Sasanqua Variegata’ is one of the small number of camellias with variegated leaves. The pink blushed flowers are quite small and often misshapen, but the overall effect is pleasing enough without being outstanding. 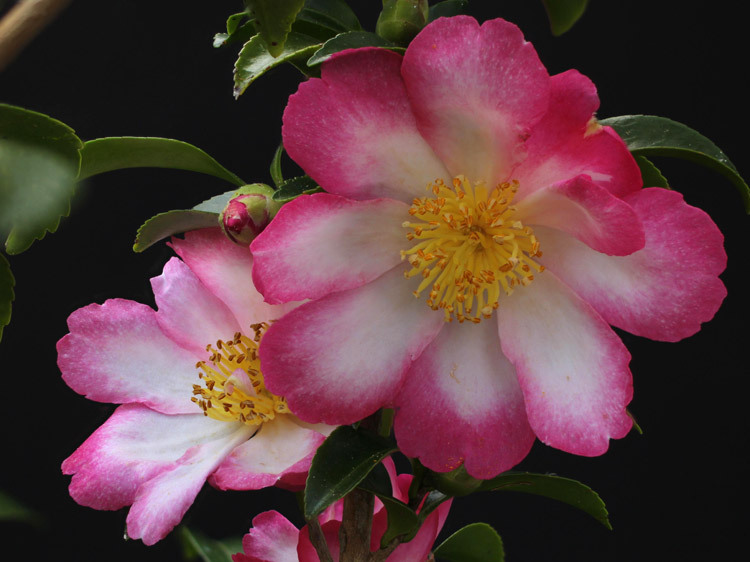 Camellia sasanqua ‘Navajo’ was given its name by Nuccio’s Nurseries having been obtained from Japan but the name lost. I have found it something of a trial to grow, but when it blooms it is superb; white with a broad red border. Lastly, and noticed only today, is ‘Sweet Emily Kate’. This I have in a pot and it doesn’t seem to me hardy enough for outdoors in the UK. As a japonica x lutchuensis hybrid this would not be surprising. It probabaly shouldn’t be flowering yet either, but it is and it’s even just about warm enough to be producing a faint but sweet perfume. Previous Post To dig or not to dig.